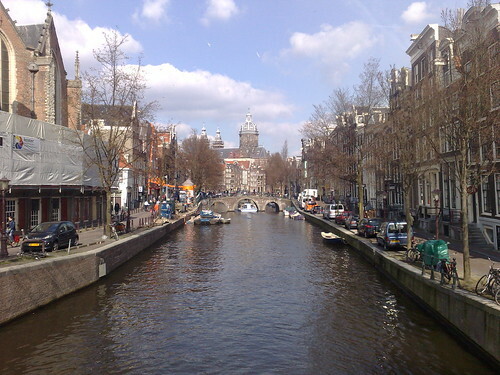 I was away in Amsterdam for the weekend – great city. Heavily overrun by Scottish football fans for the World Cup qualifier on Saturday, but it’s a great city. I was last in Amsterdam around two years ago, some things have changed, a lot of things stayed the same which was a plus and a minus in itself. While we got to spend yesterday playing the complete tourist, including roaring my head off on a short rollercoaster spin through a dungeon, the weekend was good to disconnect, indulge in too much food, revisit a few restaurants I’d been to before, take in the sun and walk around Amsterdam until my legs ached. Fair play to Aer Lingus too… between a combination of putting the foot down and having the wind at their backs, we had two great flights out of Cork airport. Major kudos too to the Cork International Airport Hotel (blog awards hotel) who lay on a help-yourself continental breakfast from 3am onwards. Chocolate croissants at 4:30am never tasted so good. For those looking for the photos, there’ll be a bunch live on Flickr likely by this afternoon.